municipality cut the program short rather than expend additional funds for what would be a diminishing return. Under the contract, either party has the right to end the program with notice; payment is only for time and materials expended as of the date the program ends. The municipality and White Buffalo, the contractor, agreed that ending the program now was the most fiscally responsible course of action. White Buffalo will provide a final report in the near future, which will be posted here. Technicians will work on private property seven days a week beginning at 4 p.m. and concluding by 11:00 p.m. They will work in the identified public parks Monday through Friday only, beginning at 6 p.m. and concluding by 11:00 p.m. Controlled Archery Hunt: 2016-2017 Season: White Buffalo, Inc., a wildlife management firm, was hired to screen, train and manage the archers who conducted a bow hunt last fall. The archers were required to show experience through harvest verification and were required to have a Bow Hunter Education Certification before beginning. The hunt took place on the following public properties: Conservation District (Connor/Terrace Road), Golf Course, McNeilly Park, Twin Hills and Robb Hollow Park as well as the adjacent public works property. Off-duty police officers were the only hunters permitted to hunt on public properties. In addition, interested residents worked directly with White Buffalo to donate their properties for the program. A total of 36 deer were removed through this program. Total cost: $9,000. Video excerpt from a seminar on pest and deer management by Jessica Walliser, co-host of “The Organic Gardeners” on KDKA-Radio in Pittsburgh, PA and hosted by the Mt. Lebanon Public Library. Effective today, Twin Hills Park has been added to the list of public properties that are being utilized in the controlled archery hunt program. All other program information remains the same. Complete FAQ available here. Mt. Lebanon Commission has authorized an archery hunt as part of an ongoing deer management effort. The program will begin September 17, 2016, and continue through January 28, 2017, with a break between November 27 and Christmas. To help the Commission make informed decisions about deer management, the municipality began collecting data and assessing options more than four years ago. The staff began tracking the number of police reports involving deer-car traffic incidents. The first full-year data was collected in 2012. Between 2013 and 2015, reported deer-car incidents increased from 43 in 2013 to 73 in 2015—a 66 percent increase. During that same time period, the number of reports the Police Department and Animal Control received related to injured/dead deer in roadways and yards increased as well and the number of requests for dead deer pickups more than doubled— from 48 in 2008 to 127 in 2015. Deer Crossing Signs: 28 deer crossing signs have been installed on state, county and local roads based on deer/vehicular and dead deer pickup data. Deer Panel Discussion: In June 2014, a deer panel discussion was held and televised online and on cable. The panel included District Justice Blaise Larotonda (moderator), Dr. Anthony DeNicola (White Buffalo), Jeannine Fleegle (PA Game Commission), Todd Kravits, PennDOT, Laura Simon (Humane Society of the United States) Tom Kelley (Mt. Lebanon Public Works Director), Sandy Feather (Penn State Cooperative) and Aaron Lauth (MLPD). Panelists answered a variety of questions about deer management. In 2015, the Commission held two forums to which the public was invited to ask questions of experts, one at Mellon and one at Mt. Lebanon High School Fine Arts Theater. These events also were taped and made available for viewing. Commission Discussion Sessions and Meetings: The Commission has discussed deer management at many Commission Discussion and Regular meetings over the past several years. Municipal Website: information, reports, articles, PowerPoints and more are available at www.mtlebanon.org. 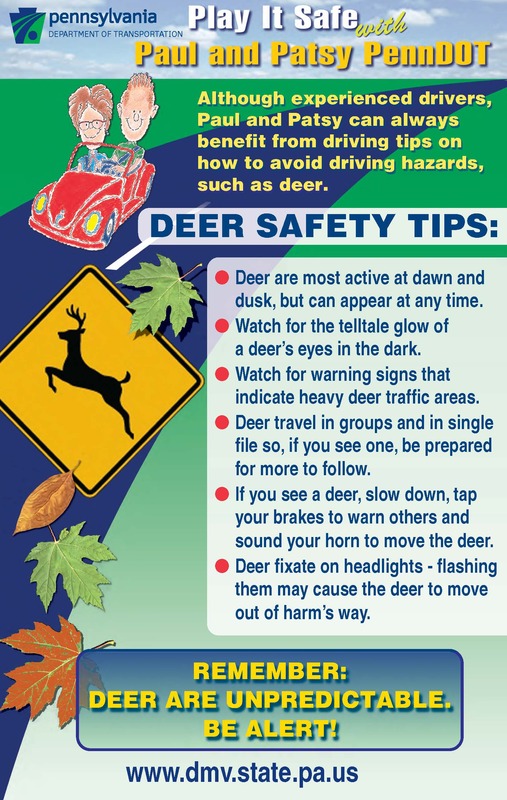 mtl magazine: The municipal magazine has published print and online articles related to deer and deer management and has provided many Facebook posts on deer management issues, including deer behavior, driver safety and deer deterrent strategies. A recent article showed the location of how deer-resistant shrubs and flowers have been used in public planting areas, serving as a demonstration project to people who might like to do something similar on their properties, as per a recommendation from Sandy Baker. 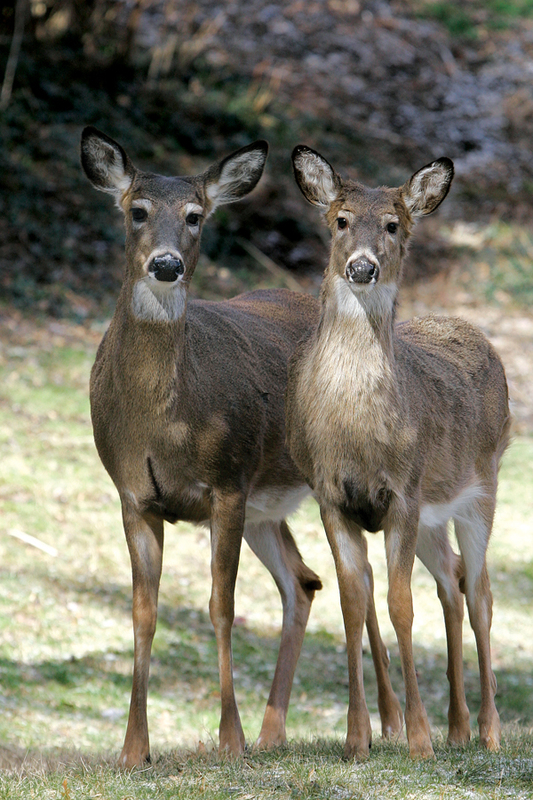 LeboALERTs: The subscription-based LeboALERT system has been used to notify residents when new information related to deer management is posted to the municipal website or during times of high deer activity, (Fawning or Rut). September 27, 7-8 p.m., Jessica Wallister, free-lance horticulturalist, Deer Proofing and Pest Proofing your Yard Naturally—Simple Strategies that Work. October 26, 7- 8 p.m., Faith Starr, Green with Faith, The Ying and Yang of Gardening: Mind Body and Spirit Gardening. Look Up Lebo: This campaign, which already has “soft launched” with a new logo and stepped up enforcement, will be rolled out at the start of school. The goal is to improve pedestrian, vehicle and bicycle safety. A video will debut in early September, and Look Up Lebo will be the main municipal magazine feature story in September. More details are available on the municipal website at http://www.mtlebanon.org/2241/Vehicle-Pedestrian-Bike-Safety. 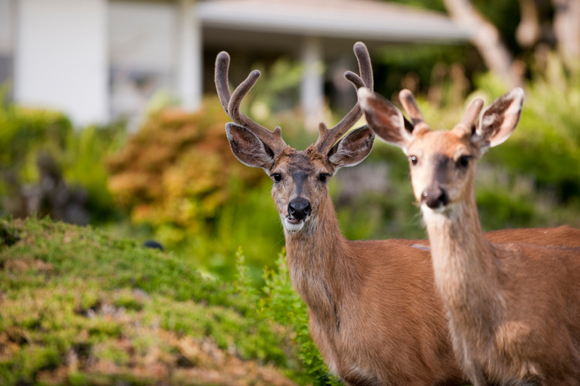 Landscaping Alternatives: The municipality has posted a list of “less preferred” plants on the municipal website and has modified the shrubs and flowers used in municipal planting areas to make these areas less attractive to deer. 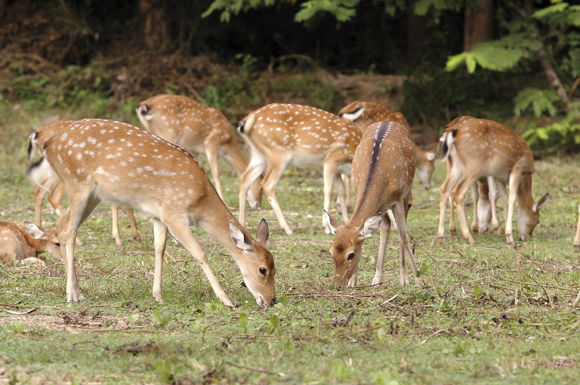 Ban on Deer Feeding: Ordinance #3212, enacted in June of 2012, prohibits the feeding of deer. Enforcement is limited because of fourth amendment rights and principally relies on residents to notify the municipality of violations. Repellents: The municipal website lists deer-deterrent products that can be applied to plantings to reduce attractiveness or palatability. Fencing: The municipality’s zoning ordinance permits the installation of fencing that can potentially limit access to property by deer. Sterilization: The municipality has pursued the possibility of a sterilization program through discussions with the Pennsylvania Game Commission. At this point, the Game Commission is unwilling to approve a deer sterilization research project in Mt. Lebanon. Letters from the Game Commission related to this issue are on the municipal website. The municipality intends to continue this discussion with the Game Commission. GIS mapping: A GIS map displaying the location of vehicle-related deer incidents between May 2011 and June 2016 is posted on the municipal website. Note: because of date limitations, only about 50 percent of reported deer/vehicular incidents were able to be mapped. In addition to these measures, the Commission has listened to a presentation on motion and auditory deterrents to deer. Such deterrents can be effective initially, but since deer are highly adaptable, they quickly become used to deterrents, making the devices less effective over time. A neighboring community installed a “Streiter-Lite” system from 1999 to 2003 but removed the system in 2003 after determining it had not been effective in reducing deer vehicular collisions. Controlled Archery Hunt: 2015-2016 Season: White Buffalo, Inc., a wildlife management firm, was hired to screen, train and manage the archers who conducted a bow hunt last fall. The archers were required to show experience through harvest verification and were required to have a Bow Hunter Education Certification before beginning. The hunt took place on the following public properties: Conservation District (Connor/Terrace Road), Golf Course, McNeilly Park and Robb Hollow Park as well as the adjacent public works property. Off-duty police officers were the only hunters permitted to hunt on public properties. In addition, interested residents worked directly with White Buffalo to donate their properties for the program. A total of 104 deer were removed through this program. Total cost: $15,460. Read summary report at http://www.mtlebanon.org/DocumentCenter/View/13897. Controlled Archery Hunt, 2016-2017 Season: The Commission will consider a contract proposal from White Buffalo Inc. to conduct another controlled archery hunt following the same procedures as the 2015-2016 program. The Commission will consider this contact for award at the August 9, 2016 Commission meeting. Total cost: $9,000. White Buffalo Inc. will conduct a deer cull using trained sharpshooters. The following documents review the sharpshooting cull taking place from February 1 through March 31, 2016. Amended permit from the PA Game Commission to allow the placement of bait beginning January 24, 2016 and sharpshooting to begin February 1, 2016. Mt. 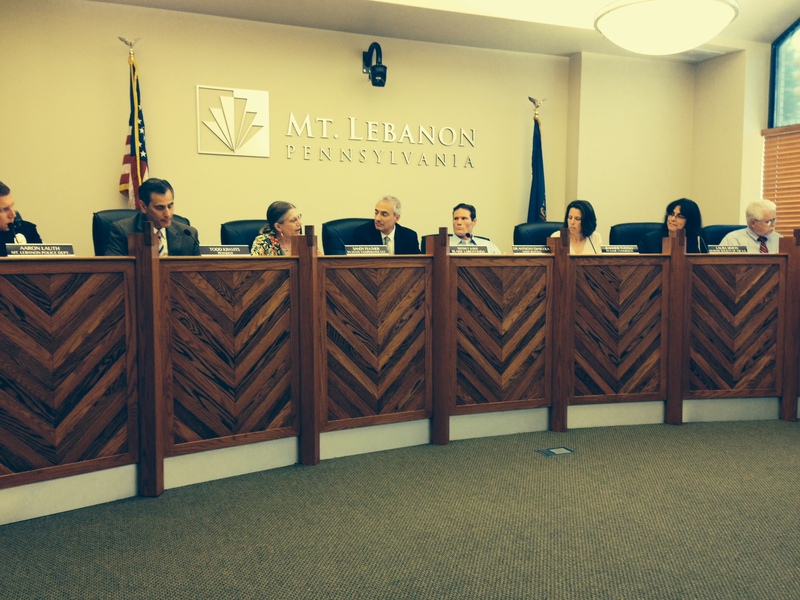 Lebanon has received its deer control/political subdivision permit from the Pennsylvania Game Commission. The permit will allow the municipality to proceed with Phase Two of the 2015-2016 deer management program pending final approval by the Commission in January. During Phase Two, scheduled to run from February 1, 2016, to March 1, 2016, White Buffalo Inc. will conduct a deer cull using trained sharpshooters on designated public land and on donated private properties. The Game Commission permit along with answers to Frequently Asked Questions appear here. The FAQ will be updated as plans move forward, if appropriate. View a copy of the permit. View locations where deer signs have been installed. Below see the sharp shooting RFP issued by the municipality as well as the response received from White Buffalo Inc. This issue will be discussed at the Commission Discussion Session on October 13, 2015. Responses from White Buffalo Inc.
Below is the information that White Buffalo presented to the Commission at the September 8th discussion session detailing the process utilized in screening and selecting the archers participating in the deer management archery program approved by the Commission as well as other program details. For the approved public areas; The conservation area at Connor and Terrace, the wooded portions of the public golf course, Twin Hills Park, the McNeilly Road park property and Robb Hollow Park and public works section of Robb Hollow Park, only archers who are also police officers are authorized to hunt in these public areas. The stated goal of the Commission is to reduce deer vehicular collisions by 50% over the next 5 years. That said, an overabundance of deer create issues related to the under story and general environmental health of our parks and open spaces. At a public meeting on September 8, 2015, the Mt. Lebanon Commission authorized a Deer Management Program archery management program. For additional information please read our Frequently Asked Questions related to deer management. Also available for review is the notification sent to the School District regarding Deer Management. White Buffalo Inc, the wildlife management firm hired to screen, train and manage archers who will conduct a bow hunt this fall, has concluded recruiting hunters. The archers, who will hunt up to 12 hours a week, were required to show experience through harvest verification and will need to have a Bow Hunter Education Certification before they can begin. Applicants who made an inquiry to White Buffalo by July 28 will be sent an application. White Buffalo Inc. has enough properties in the pipeline to proceed with the hunt. At this point they are only considering properties with a minimum of one acre, or properties that are near ravines, power lines, or other areas with at least 1/2 acre of woods or heavy vegetation. Informational meetings were held in the commission chamber of the municipal building Saturday, August 15, at 10 a.m. and Monday, August 17, at 7 p.m. View the presentation here. Residents also may contact White Buffalo directly by emailing mtlebodeer@whitebuffaloinc.org (please add to your address book to avoid responses going to spam) or applying online at http://www.whitebuffaloinc.org/#!contact/c1z0x. Please type "Mt. Lebanon Archery Program" in the subject line of the online form and complete the rest of the information requested. Properties in dense residential areas with few trees will not be suitable for the program. Please do not contact Mt. Lebanon Municipality directly. White Buffalo representatives plan to attend the September 8 commission discussion meeting at 6:30 to describe the final program, including the backgrounds of the manager and hunters, the number of public and private properties to be used and the safety procedures that will be required. Click here to review the contract detailing the June 30, 2015 deer management proposal. The first of three special sessions where the Commission will review and refine its goals is Monday, June 22, at 6 p.m. at Mt. Lebanon High School Fine Arts Theater. The topic is deer management. Other sessions will be Monday, July 27, at 6 p.m. on pedestrian/vehicle safety (location to be announced) and on Saturday, August 8, at 8:30 a.m. on financial trends/public outreach (location to be announced). All meetings will be taped and webcast the following day. Earlier this year, the Commission agreed to make these four topics high priorities. The purpose of these special sessions is to allow the Commissioners to have in-depth conversations about complex topics and give invited experts adequate time to serve as resources. Please note: These are work sessions. The public is welcome to attend and listen, but there will be NO OPPORTUNITY FOR PUBLIC COMMENT. Residents may comment on any of the issues at regularly scheduled commission meetings. Consultant Sandy Baker, who some call the “deer doctor” will visit Mt. Lebanon Saturday, April 25, through Monday, April 27, to speak with residents and elected officials about deer-deterrent strategies as part of a comprehensive deer management plan. 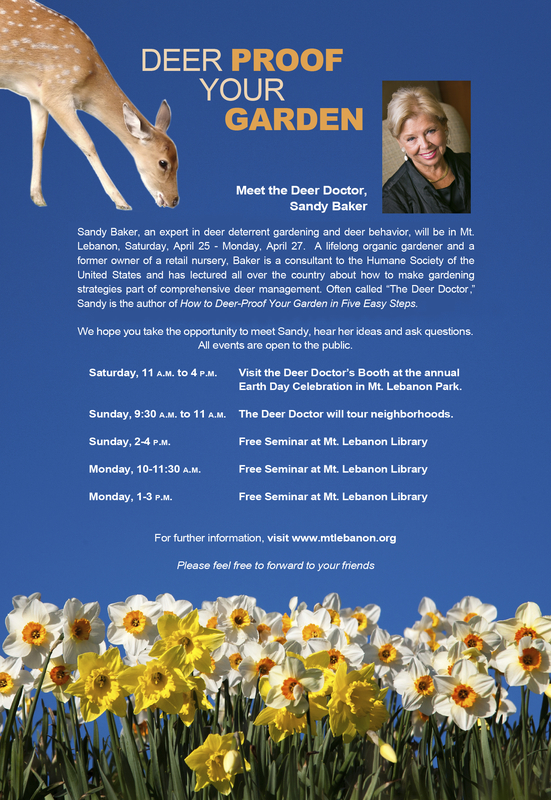 Baker, author of How to Deer-Proof Your Garden in Five Easy Steps, is a life-long organic gardener, has owned a retail greenhouse/nursery and currently is a consultant to the Humane Society of the United States. Based in New York, she is well known for her leadership in the areas of wildlife and environmental protection and has presented seminars to garden clubs, at garden shows and to master gardeners around the country. Baker’s visit to Mt. Lebanon will include a hands-on presentation on gardening at Earth Day in Mt. Lebanon Park, Saturday from 11 a.m. to 4 p.m. She will tour Mt. Lebanon neighborhoods Sunday from 9:30 to 11 a.m. Free seminars are set for the Mt. Lebanon Public Library Sunday, from 2 to 4 p.m. and Monday, from 10 to 11:30 a.m. and 1 to 3 p.m.
No registration is necessary for any of the events. Mt. Lebanon’s spring deer management program, which was to have run through March 31, has ended, and the corrals have been removed from five local park areas. Using the capture and euthanize method, Mt. Lebanon had hoped to cull 150 of the community’s estimate of 400-500 deer, in an effort to approach the goal of reducing deer/vehicular crashes by 50 percent within five years. Only six deer were killed utilizing the corrals. Mt. Lebanon implemented the capture and euthanize program as part of a multi-year approach to deer management, and after it became impossible to proceed with a planned bow hunt program. The method was approved and deemed safe by the Pennsylvania Game Commission. Even though the number of deer culled did not approach Mt. Lebanon’s goal, the Game Commission’s deer biologists, which monitored the process, were satisfied with the functionality of the system and feel this method will be a viable option in the future of urban deer management in Pennsylvania. Wildlife Specialists, which was contracted to cull up to 150 deer at $500 apiece, began the program March 10 and chose to end it early because of several factors, according to a letter from the firm’s president, Merlin Benner, which thanked police for their cooperation and urged that a deer management plan continue. The factors Benner cited that made it impossible to achieve the program’s goals included the fact that the cull began much later than the expected early February start date. In addition, the weather warmed almost as soon as the program began, leading to an immediate drop in the number of deer entering the corrals for food. Finally, direct sabotage of the corrals and disruption of the animals in the areas surrounding the corrals led to fewer deer entering the corrals. Photos taken by the Game Commission of trapped deer showed no signs of panic or self-inflicted injury. All deer killed were delivered to a processor for processing, storage, and ultimately, delivery to a charitable food pantry as required by the permit. Mt. Lebanon’s Commission will continue to consult with experts and engage residents to evaluate all available deer management options in the near future, including non-lethal and lethal methods. The Pennsylvania Game Commission has issued a permit to Mt. Lebanon to use the capture and euthanize method of reducing the deer population. Wildlife specialists will be conducting the program in five public park areas through March 31. The capture and euthanize program is part of Mt. Lebanon’s comprehensive deer management plan. Wildlife Specialists, a natural resource consulting company based in Wellsboro, Pa., headed by certified wildlife biologist Merlin Benner will perform this service. All members of Benner’s team have extensive experience in wildlife management and are permitted by the Pennsylvania Game Commission. The five public park areas where the corral traps—six sided enclosures with 8-foot-high fences—will be placed are: McNeilly, Bird, Robb Hollow park, Mt. Lebanon Golf Course and the Connor Road conservation district. All five areas will remain open during the day. The traps will be baited and monitored remotely by camera. When a group of deer enters the trap, the gate will close remotely, and a team of trained professionals will be dispatched immediately to euthanize the deer using suppressed, small-caliber rifles at close range, mostly at night. The method is considered to be very safe, and people should not hear any loud noises from these activities. The contractor will post signs indicating the perimeter of the area where traps have been placed. Stay out of the posted work areas, and report any suspicious activity by calling 911. Please remember that all of these park areas close to the public at 9 p.m.
Q: What are the goals of the project? A: The overall goal of Mt. Lebanon’s deer management program is to reduce deer/vehicle collisions within the municipality by 50 percent within five years. The capture and euthanize phase for 2015 will take place in February and March. Q: Who determined the goals and the course of actions? A: The Mt. Lebanon Municipal Commission, representing the residents, voted to trap and euthanize as part of the comprehensive deer management plan. They received much input from residents at public meetings and other means and also solicited input from a variety of professionals and interest groups. Q: Explain the methods to be used. Why is trap and euthanize effective? A: Corral traps will be built and baited in safe public areas over a period of several days. The bait will attract deer to the corrals. Trail cameras will monitor the corrals, sending real-time images to the trappers. When large groups of deer are inside a corral, a text message will activate the closure of the gate. Immediately, a crew will dispatch to shoot the deer using suppressed, small-caliber rifles. Most of the shooting will take place at night. This method should be more effective at capturing large numbers of deer than either the clover traps, which capture single deer at a time, or possibly even sharpshooting, where larger groups of deer can’t be taken without the possibility of some escaping. Q: What will happen to the deer meat? A: Euthanized deer will be taken to a local processor, which will process and package the meat and deliver it to local food banks and shelters through the Hunters Sharing the Harvest program. Q: Who is conducting this project, and what are their qualifications? A: Wildlife Specialists, LLC, has been selected to provide the capture and euthanization services. The company has a strong team of wildlife professionals who have broad experience within Pennsylvania and beyond. All individuals assisting with this project in the field are permitted through the Pennsylvania Game Commission to conduct these activities. For more information on Wildlife Specialists, visit their site at www.wildlife-specialists.com. Q: Why is this being done instead of hunting? A: As first step in its deer management program, Mt. Lebanon had planned to conduct an archery hunt but was unable to get the program in place this season in time to obtain the required permit from the Pennsylvania Game Commission. The high density of homes in Mt. Lebanon and the Safety Zone requirements for hunting in Pennsylvania make hunting, when not combined with other methods, a ineffective option for achieving a meaningful reductions of the deer population here. Mt. Lebanon does intend to use limited archery hunting to supplement the deer control program in future deer hunting seasons. Q: Why can’t the deer be captured and transferred to another location? A: The Pennsylvania Game Commission and similar wildlife agencies across the United States have decided to discourage the transfer of white-tailed deer for many reasons. The primary reason is to minimize the spread of diseases like Chronic Wasting Disease. Other reasons include not transferring problems of deer overabundance from one area to another. Often people cite low deer populations in another area as being a reason to move deer into those habitats, but most often those low populations are a result of poor habitat caused by historically unbalanced deer herds, where the high populations degraded the habitat, and the habitat is taking time to recover. Q: Is this method more humane than other options? A: The stress on the deer will be minimized by not handling them (which is inherent to other capture methods or even tranquilization) and because the shooting will take place under the cover of darkness. Death will be immediate and painless. The very close range will prevent misses or wounding. For additional information on white-tailed deer or municipal deer control, visit the Pennsylvania Game Commission’s website at www.pgc.state.pa.us. EDUCATE YOURSELF ABOUT DEER ISSUES IN MT. LEBANON. View a panel of experts discussing the topic. These are LARGE files. They may take some time to download, please be patient.